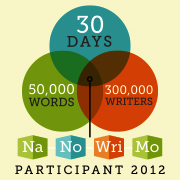 NaNoWriMo is going splendidly even if I’m starting to get a bit crazy. This afternoon I crossed the 21,000 word mark. I’m about 300 words ahead of schedule.that puts me at having finished the rough of chapter 17. Wow. It’s been awesome, but quite exhausting at the same time. But being ahead means I’m allowing myself a little leeway to revise (since revision doesn’t give the same word counts, I have to be ahead before I can commit to them). That means I’m trying to revise chapters 11 and 12 tonight. I know I’ll get one done. Hopefully I can do both.